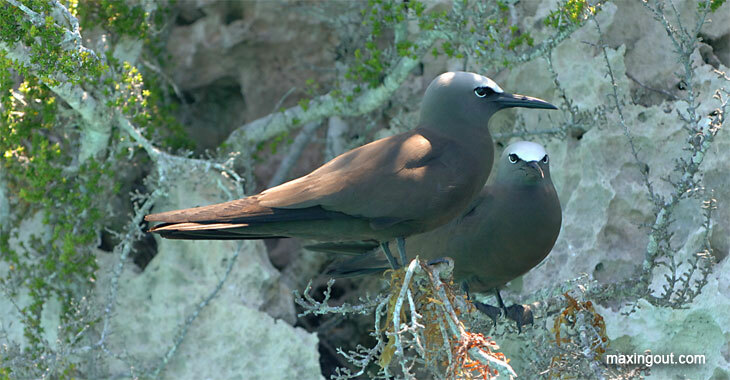 June is nesting season for noddies in the Bahamas. 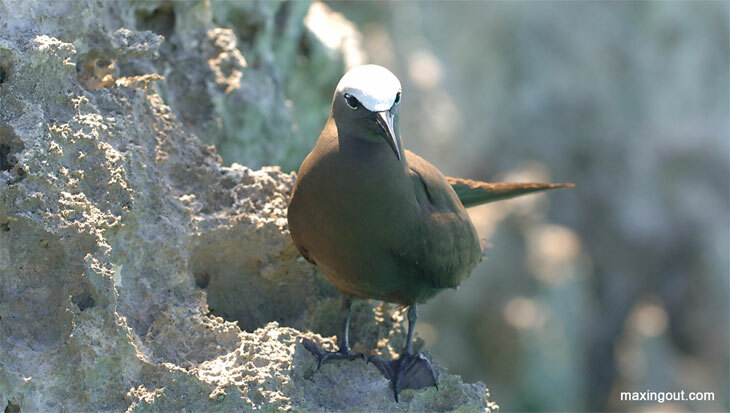 Along the cliffs and uplifted coral outcrops, the noddies tend their nests. I don't speak noddie language, so I don't know what the noddies are saying, but based on their body language, it appears that these birds really do care for each other. It looks like these birds are snuggling. What do you think? Do birds snuggle? This noddie has opted for a simple nest on the ground, and this spot should work just fine. It's inaccesible to predators and has elevated sides so the egg won't roll out and the noddie young won't fall out either. It also has a good view of Thunderball Cave. What more could you ask from a nest? This noddie is giving me a tongue lashing. He is not happy that I am inside his bubble, and he is squawking out his displeasure. Although he's not sticking his orange tongue out at me, he's giving it quite a work out. Although I don't know exactly what he said, I got the message and backed off. These two noddies are discussing where they will build their nest. Fortunately, in Noddie Land, you don't need a realtor, lawyers, a down payment, or a thirty year mortgage to make your nest. 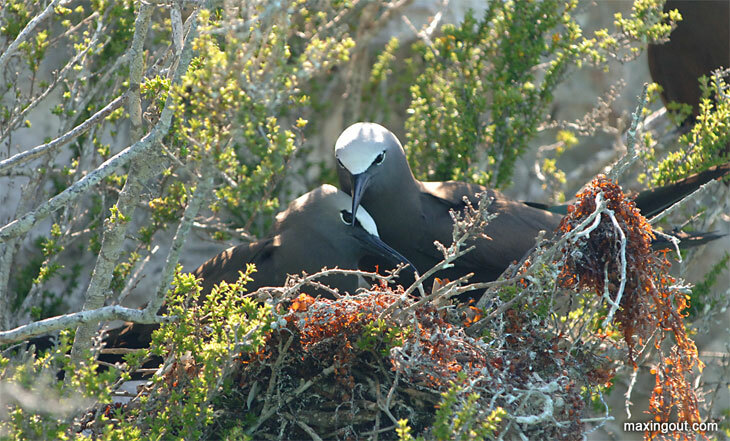 You can satisfy your nesting instinct with a simple bush, nook, or cranny anywhere in the coral outcrops. This curious noddie let me approach within two feet of his perch. He remained silent as he quizzically examined the alien invader with a camera floating by on the gray Avon dingy. This bird is not tame, but he also is not afraid. Imagine what the world would be like if all the animals could trust us to not harm them. They would go about their business, and we would go about ours, and both of us would live long and prosper. It would be a wonderful world. Come to think of it, it is a wonderful world, and life is good.